In this unique vitalizing herbal tonic we have synergistically infused with some of the best natural blend of honey and herbs. HIS HONEY is a deliciously creamy healthy tonic.Can be mixed in any hot or cold beverage. Take 1 tablespoon (adult) daily, or as directed by your health care provider.Caution: Pregnant or lactating women should consult a doctor before using any product. Consult your doctor before use if you have, or have had, ANY HEALTH CONDITION or if you are taking ANY MEDICATIONS OR REMEDIES including OTC medications, or are planning any medical procedure. Discontinue use and consult your doctor if any adverse reactions occur, such as gastrointestinal discomfort. His honey is not a cure or a substitute. NOT INTENDED FOR USE BY PERSONS UNDER THE AGE OF 18. KEEP OUT OF REACH OF CHILDREN. Black Seed & Honey (Original) 16 oz. 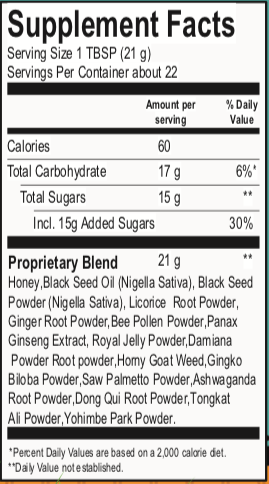 Black Seed Tumeric Ginger Honey 16 oz Power QS Nutritional Honey Blend 16 oz. Raw Wild Flower Honey 16 oz.